Infinite is defined in the dictionary as limitless or something that will never end. That has become the romantic meaning behind the infinity sign, a symbol of never ending love. This timeless and elegant infinity sign necklace is made from sterling silver and embellished with natural gemstone and sea shell. The pendant rests on a sterling silver cable chain that measures 18 inches and is finished with a spring ring closure. An amazing piece by artisan Kung from Thailand, this handcrafted necklace is a unique expression of everlasting love. Please note that the pictures may not be true to scale, see dimension for the actual size. Yuu is the younger sister of another featured artisan, Kung. Yuu started working in her sister's silver shop at young age and, with the help of her family, has opened her own jewelry shop. Just like Kung, Yuu uses sterling silver but incorporates other unique materials that enhance the design. 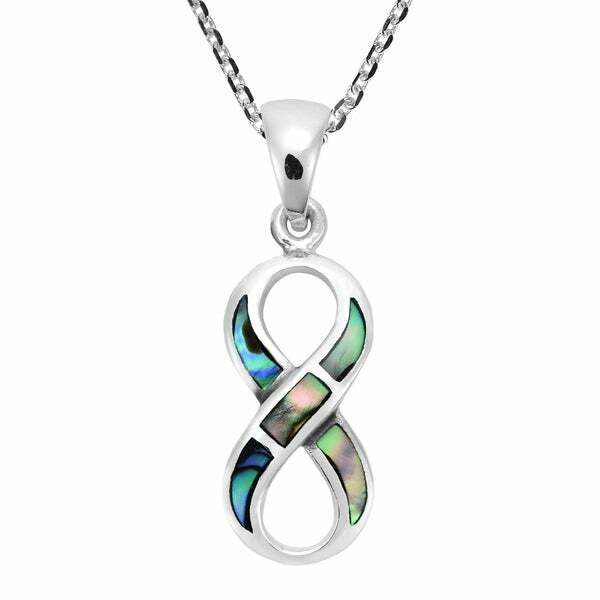 Yuu loves the fusion of sterling silver with vibrant colors from stones and native sea shells. Yuu and Kung work together sharing ideas and inspirations. With the income from their jewelry shops, Yuu and Kung are able provide for their families and their local community. All weights and measurements are approximate and may vary slightly from the listed information. Treatment code . See Treatment Guide for further information. T.W. (total weight) is approximate. The weight may vary up to two-tenths of a carat. Dimensions 1.1 In. X 0.35 In. X 18.0 In. September Birthstone Information from Overstock.com. Birthstone jewelry makes a great gift! Learn more about sapphire and lapis jewelry. Best Diamond Alternatives from Overstock.com. Our guides provide customers with information about diamond alternatives. How to Clean Jade Jewelry from Overstock.com. Take care of your jade jewelry and you will be rewarded with a stunning piece that will last a very long time. How to Clean Opal Jewelry from Overstock.com. Once you understand a few basic techniques, cleaning your opal rings, necklaces, bracelets, and earrings will be a simple process. Colored Gemstone Checklist from Overstock.com. Learn about dazzling jewels with this illustrated checklist of popular gemstones.